I feel so honored to have been asked to write a review of this book. I’ve known Doug since his early orchestral career days. He then played in the Baltimore Symphony Orchestra and we shared a mutual chief-conductor, Sergiu Comissiona. This was more than 40 years ago so our contact was mainly by letter. I remember how impressed I was by Doug's erudite writing about our job as orchestral bass trombonists. These letters were always long, interesting, detailed, positive and full of ideas and opinions. Since then we stayed in contact and I followed Doug's career with great interest. I listened to his wonderful playing on many recordings with the Boston Symphony and the Boston Pops and I read all his interesting articles and publications on different platforms. In his preface for the book, Doug gives his reasons for writing this immense reference work. I recognize the situation Doug describes from back in the early 1970s quite well. Back then, we had the orchestral excerpt books by Allen Ostrander and Julian Menken for bass trombone and books by Keith Brown, Alfred Stöneberg, and others for trombone or low brass section excerpts. Many times we had to copy our parts by hand from scores we got from the library. With the advent of the digital age it became much easier to find parts. Some websites even host copies of complete, downloadable orchestral parts. With all these new age possibilities, one might question the need for a book like this. But please read on, because with this book, Doug created an instant classic and must-have on every trombonist’s book shelf. When the book arrived on my doorstep, I browsed quickly through the pages. I remember my first thought was; “Wow, I wish I had this 45 years ago.” After more thorough reading, I even played with the idea of writing the shortest review ever. Something like “The highest recommendation for all bass trombonists. It's just perfect!” But although that properly summarizes this review, it wouldn’t do justice to the effort that was clearly put into this work. The Symphonic Audition: Doug’s observations and ideas are all to the point and helpful. The Symphonies of Anton Bruckner: Recommendations about dynamics and articulations coming from someone who has so much experience with Bruckner’s music makes this such a bonus. A Glossary of selected German Musical terms: Extremely useful if your German isn’t so good! Richard Strauss and the Trombone: Interesting background about how Strauss used the bass trombone in his orchestrations and how his sense of humor was borne of his experience as a conductor. The Contrabass Trombone and Cimbasso: A short history of these two interesting instruments and their use in the orchestral and opera repertoire. Let’s move on to the excerpts themselves. Overall, I think Doug's selection is complete. Most of the important repertoire is here and on top of that some not so well known but interesting pieces. Of course, one could argue that English repertoire like the Vaughan Williams symphonies, particularly No.4, Janacek’s Taras Bulba, frequently asked for in Czech auditions, or Symphony No.3 in B minor, Ilya Muromets, a large symphonic work by Russian composer Reinhold Glière, would have been great additions. But because this book is not part of the "The two hundred..." series, Doug obviously had to draw a line somewhere and limit his selection of excerpts. The pieces he did include are full of detail. All the essential fragments of these excerpts are in the book, complemented with short biographies of their composers. Doug even elaborates on errors present in many publications of the original bass trombone parts and carefully corrected them. Without being dogmatic, Doug shares with us his ideas of how to play each excerpt. Some pieces, like Strauss’ Ein Heldenleben and Wagner’s Der Walkürenritt even get a whole page of great suggestions. Metronome markings are given for every excerpt, either from the composer or as suggested by Doug. In all the choral pieces like Mozart’s Requiem or Haydn’s Die Schöpfung, Doug includes the text, which helps us decide where to breathe. On occasion, the complete low brass section is printed where useful. I can see Doug’s orchestral career has been in the U.S. Especially when he states that Bach’s ‘Sarabande’ from Cello Suite No.5 is the most frequently asked solo piece for bass trombone. While in Europe, Sachse’s Concertino in F major, Lebedev’s Concerto in One Movement and Bozza’s New Orleans are actually more popular requests. It’s probably the only nuance I would like to add to this otherwise perfect book. It is impossible to tell you in enough detail about all the great knowledge contained in the 266 pages of this book; it is chock-full of valuable information. Believe me, this is definitely one to add to your library. 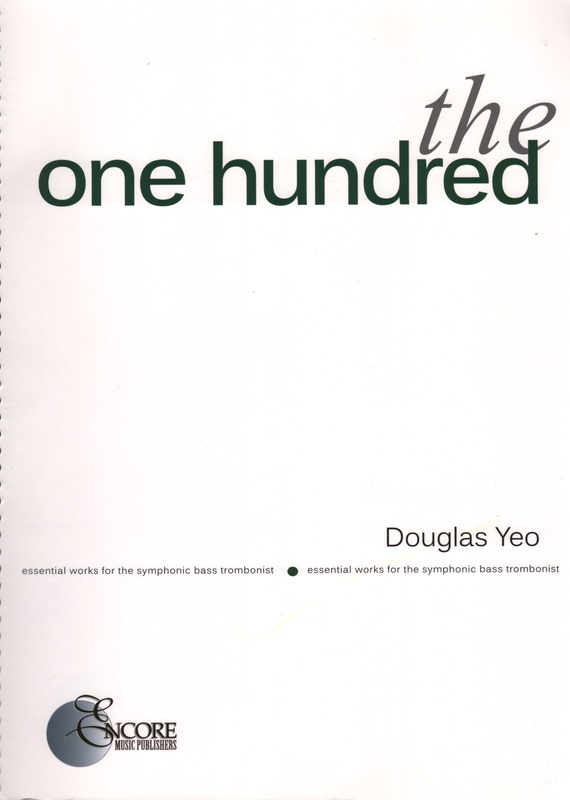 Perhaps Doug could work on a next volume called, “The One Hundred – Essential Works for the Opera Bass Trombonist.” For me, he proves to be the most suitable author for a book like this.